CHICAGO – August 22, 2018 – LotLinx, the automotive industry’s No. 1 artificial intelligence (AI) company, announced today it has named Eric Turner Vice President of Product Management as the company moves to develop new offerings to meet the growing need for auto dealers to evolve their advertising spend and strategy. Turner comes to LotLinx with a deep understanding of the automotive industry developed while working at Ford Motor Company where he led key initiatives to grow the Lincoln brand during the past five years. His major contributions to Lincoln include leading the marketing team during the development of the company’s newest flagship SUV, the 2018 Navigator, developing and executing the go-to-market strategy for the 2017 Continental, and collaborating with dealers in the Pacific Northwest to grow sales and service market share and profitability. 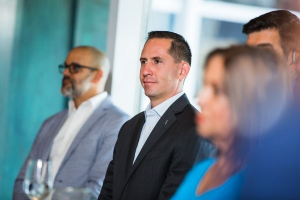 As the top company in Crain’s Chicago Business “Fast 50” list, LotLinx added Turner to the team to accelerate business progress by growing the company’s portfolio of AI-based digital advertising solutions. In this role, he will lead the development and launch of new offerings including some that are currently nearing completion. This fall, LotLinx will attend several industry events, including Digital Dealer 25, DrivingSales Executive Summit, Autovate, Used Car Week, Kain Automotive, Automotive Analytics and Attribution Summit. Members of the company’s leadership team will be present at many of these conferences to discuss the company’s plans for upcoming initiatives to continue to help dealers optimize media spend. For more information, visit www.lotlinx.com. LotLinx is the automotive industry’s No. 1 artificial intelligence (AI) company dedicated to empowering automotive dealers and agencies through its Vehicle Identification Number (VIN)-Specific™ digital marketing platform. Thousands of car dealerships across North America have successfully leveraged LotLinx’s approach to delivering purchase-ready shoppers to their websites. In the past five years, the company has grown more than 67,000 percent, earning it the No. 1 spot on Crain’s Chicago Business’ 2018 Fast 50 list, along with a spot on the Auto Remarketing Power 300 for 2018. LotLinx partners with many leading brands, including Audi, GM, FCA, Ford and Mazda for Cooperative Advertising programs that reimburse up to 100% of a dealer’s marketing spend. Founded in 2012, LotLinx now works with global technology leaders and serves many of the nation’s Top 100 Auto Groups. To learn more, visit www.lotlinx.com.